Ah, summertime. The perfect season to forgo bowls and use fruit instead. Let’s do this! Have you ever tried a papaya? My first time was when we vacationed in Bali and it seemed to be the star of most fruit platters. The flavor was a little unique at first and I couldn’t decide if I loved it or hated it. I’m kind of a watermelon and cantaloupe kind of girl, but I must admit this juicy, tropical fruit is growing on me. 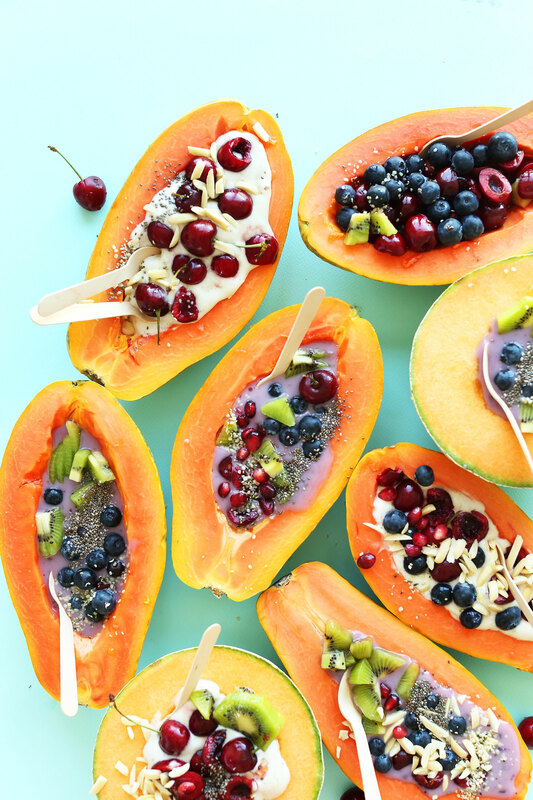 Not only is papaya sweet, juicy and tender, it’s also super healthy! Serious bonus. 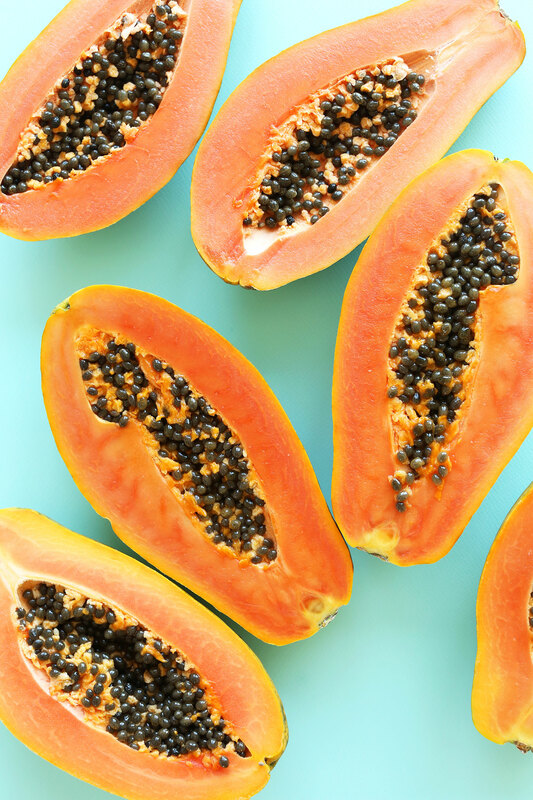 Papaya is packed with Vitamins A, C, and K, and it also boasts plenty of fiber, potassium, and folate. If the health perks still don’t win you over, try cantaloupe instead! It works beautifully in this recipe as well. This recipe may be my simplest yet! I don’t know where the concept originates from, but it’s essentially a fruit bowl of goodness. 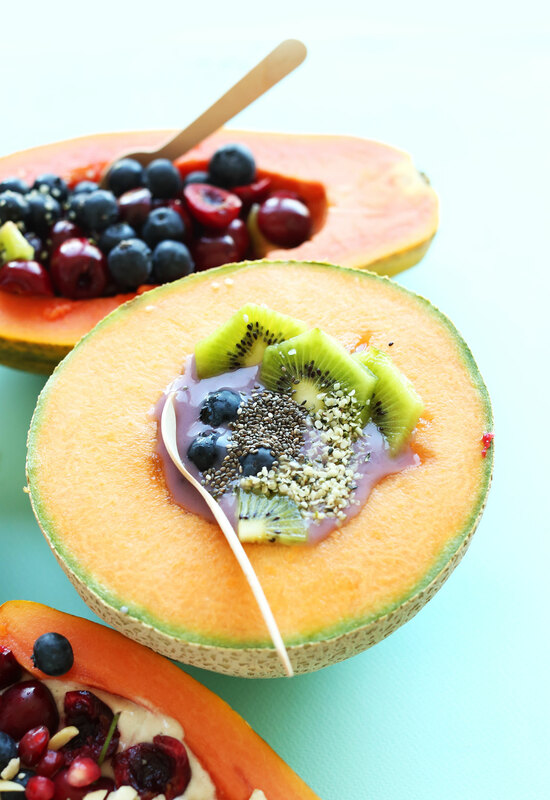 Simply halve your papaya or cantaloupe, scoop out the seeds, and top with whatever you can round up! If you give this recipe a try, let us know by leaving a comment and rating it! And be sure to show us by taking a picture and tagging it #minimalistbaker on Instagram! We love seeing what you come up with. Cheers! 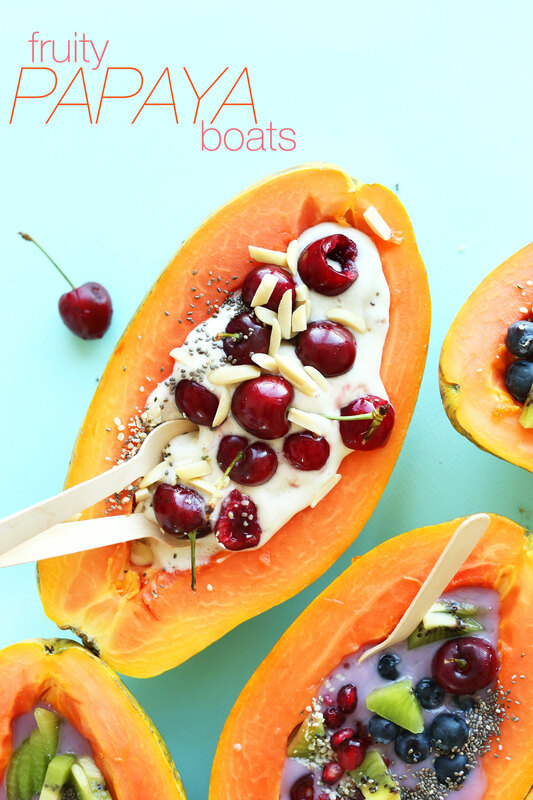 Tropical papaya boats with loads of topping options! Load your fruit with coconut yogurt or banana ice cream and go to town with fruit, seeds, and nuts! A healthy, plant-based breakfast or snack. To make banana ice cream (instead of using dairy-free yogurt), add 2 (amount as original recipe is written // adjust if altering batch size) ripe, previously sliced and frozen bananas to a blender or food processor and blend on low until a creamy ice cream consistency is reached. Scrape down sides as needed, and add a splash of almond milk if it has trouble blending. To assemble papaya (or cantaloupe) boats, simply fill the hollow centers with desired amounts of banana ice cream or coconut yogurt, fruit, nuts, and seeds! Enjoy immediately - best when fresh. *Nutrition information is a rough estimate calculated with toppings. These were amazing and so flavorful! Yay! Glad to hear it, Karen! Hi! I was looking for some cool papaya pictures to use in a project and saw this (Like wow, amazing) picture and wondered who the author was, or if it had copyrights. I guess you took it, so is it free to use o do you manage any type of permission? excelent recipe i love it !!!!!!!!!!!!!!!!!!!!!!! This looks amazing! So refreshing! I first tried papaya on a cruise, and it was amaaazing! But I’ve tried it since, and I think the fruit had gone bad, because it was disgusting. How do you tell it a papaya is ready to eat? This video is a great help! I hope to find fresh tropical papayas nearby because I can’t wait to enjoy these colorful refreshing treat. Can’t wait to have it! Thanks for sharing! I grew-up having only cut-up papaya for break-fast every day as I dislike coffee or bread.. South-american papayas are huge, maybe 25cm. long, enough to fill-up 4 people for breakfast. mun. Papaya grows in hot weather. Depends where it comes from, is the color inside which varies from peal yellow to the very sweet very redish-yellow from the Caribean . In Canada we get papayas from Mexico ,the Caribean and from Hawaii. The papayas from Hawaii are very small, come green and you have to put it to ripen in a warm spot.Papayas are very delicate, with a very fine and thin skin. This delicios fruit is very rich in fiber good for the digestion and help with constipation. I like my papaya the way it’s served in Honduras (and other countries, I believe) with a spritz of lime juice. Adding other toppings can only take it to the next level. Oh, yum. What a great way to serve fruit. So simple, yet ingenious! I LOVE papaya! My go-to breakfast, snack, dessert is chopped up ripe papaya, pineapple and mango sprinkled with a heavy dose of coconut flakes. Not the small ones but the shaving-like coconut. To make it more of a dessert I add a whipped topping. My husband grunts and groans (in a good way!) when he eats this. I never seen him inhale fruit like that before! The next time I will just chop up pineapple and mango and put that in the papaya boat! Thanks Dana! I enjoy getting emails from you. These are gorgeous and so fun! I love papaya! I could sail away with these! This is taking advantage of all the Summer goodness here- Yum! I’m not a huge fan of papaya on it’s own but pimped up- I’m a fan! This is so creative! I hope to make this, or some derivative, later this week — figs are in season where I am now and I bet they would be delicious with papaya or another fruit! What a fresh and fun idea for summer! Love it! Such a beautiful idea! Nice summer dessert! 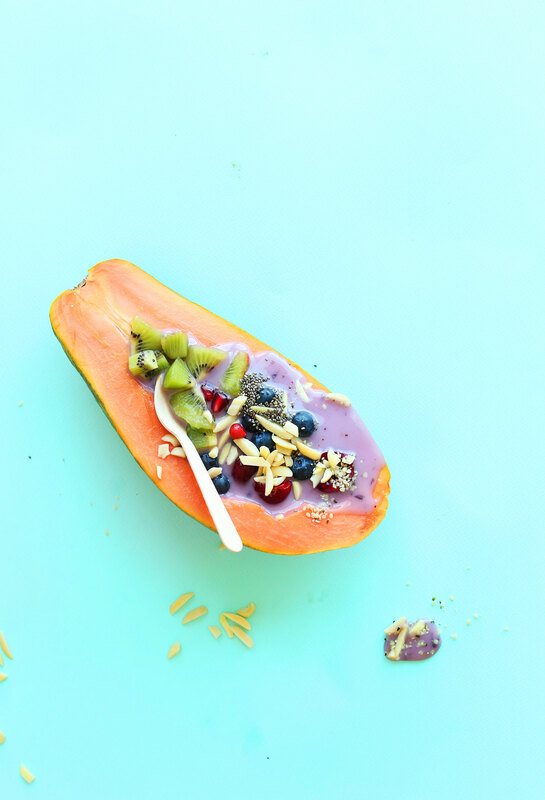 I love Papaya so much and this will be one of my new favorite ways to eat it. such a great idea! I love FUN food! ;-) so summer-y I love it! and I love all the toppings for extra flavor and texture!!!! Those look like the perfect summer treat! Papaya brings back great memories of vacationing in Hawaii! I like the new colors and finally the search box it’s easy ti find!!! You are inspirational ! can I say ” inspirational”, I mean does it actually mean what I want to say? Never mind, it’s a compliment ! Beautiful recipe as usual, but I have a question for you. I have a Canon 650D at the moment but soon (hopefully!) I will move to a canon full- frame DSRL, yuhhhuuu! I am tempted to buy a wide angle but not really sure which one is best for food photography. I was thinking about the Canon ef 28mm f 1.8 usm or the 35mm, but I’m not quite sure which one is easier to use and which one is best for food photography. I have a 50mm 1.4 and a macro 60mm 2.8 at the moment and I need a good lens to shoot from above! I love your blog, your food photography school, your pics.. Thanks for everything you do to help peopole like me that just started ! Love this idea, and love papaya! Who needs banana splits when you could have something this beautiful and delicious-looking?! I have never tried fresh papaya – only in bought smoothies, but I am sure I will love the flavour. This is such a clever idea for summer, especially with the cooling banana ice-cream. The first time I tried papaya I hated it and I kept accidentally eating it thinking it was mango and I hated it more and more each time, but it’s grown on me. And this makes me want to get one so bad! Love your little changes on here! It looks so good! Simple and fresh! I love how bright and cheery these boats are! They look refreshing and perfect for summer! I’ve never had fresh papaya, but this looks too delicious NOT to try it! I love stuffing cantaloupe with yogurt/granola, so I’m betting that I’ll love the papaya version just the same! P.S. I’m loving the site beautification!